Smartphones and tablets help increase TV viewing | What Hi-Fi? Smartphones and tablets are driving families back together in front of the living room TV, with teenagers coming out of their bedrooms and multitasking in front of the family telly. So says the latest report from industry regulator Ofcom, which has surveyed 3700 over 16s. According to the statistics, 91% of adults watch the main TV in the home once a week – up from 88% in 2002 – but they may be distracted while doing so. More than half of those surveyed admitted they often distracted themselves from what was on the TV by talking on the phone, texting, using social networks or watching different content all together on YouTube or other streaming sites. "There are number of factors that are fuelling this – we're now watching on much bigger, better television sets," says Jane Rumble, Ofcom's head of media research. 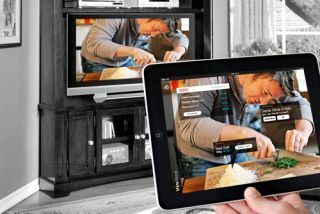 The survey reveals that 49% of TV viewers use a smartphone or tablet while watching telly, while 25% share their viewing via phone, text and social networks. Ofcom says just over half of UK adults now use a smartphone, up from just 27% two years ago, and the number of tablet owners has more than doubled, from 11% to 24%. As a result of the proliferation of mobile devices, teenagers are now less likely to have a TV in their bedroom. But the TVs in our living rooms are getting bigger, with sets above 42in accounting for 15.8% of all TV sales during the first three months of 2013, up 4.3% on 2012, says Ofcom. And despite the popularity of catch-up TV services such as BBC iPlayer, the majorrity of programmes are watched at the time they are broadcast.